Why ask an IT specialist how to extend your wifi range? Wifi is nothing else than a digital radio signal in the 2.4GHz or 12cm SHF band. You need a communication specialist to tell you the secrets, someone like the amateur radio operator who wrote this blog post. 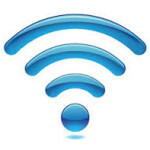 Here are some common reasons why your Wifi range is limited or Wifi is slow. Hook up your PC to the network via a Cat.5 network cable. You always have full speed even if your cable is 300ft or 100m long. Working at Gigabit? Use Cat.5e or better cable. Do not use a repeater on a location where your Wifi speed is already low, because your repeater will connect at low speeds, repeating only low speeds. Instead install network cables from your gateway to every location with weak reception and install a simple acces point on those locations. Those access points will communicate with the gateway with maximum speeds. Give al the access points the same SSID and let them work at different channels, like channel 1, 6 and 11. Even close to your Wifi gateway, the speed is still low. That usually indicates a congested network. Depending on your country, you have up to 14 channels available. The common used N standard (802.11n) means your network uses a bandwidth of 4 channels at the same time. So in fact there are are only three separate N channels available which you share with other wireless 2.4GHz devices like your home telephone, speakers, keyboard, mouse, remote controls and all your neighbours Wifi and wireless 2.4GHz devices. You can check all wifi network nearby running the program inSSIDer on your computer or Wifi analyzer on your Android device. If you have a congested network and you cannot use cables, there is only one good solution. Move to 5GHz Wifi (802.11ac standard). Most new mobile devices like iPhone 5 and iPad 2 have 5GHz inside. Some routers also have 5GHz inside. If not, you can buy a 5GHz access point or router and a 5GHz USB dongle for your laptop or computer. The range of 5GHz is a lot less than 2.4GHz, but there is much more bandwidth and only little to no interference. You can use a cheap solution to amplify the signal transmission and reception at your gateway. Just take a piece of aluminium foil and fold your own signal reflector. No guarantees for better signals, but cheap enough to try. Do NOT use Power Line Communications (PLC) devices which use your home’s electrical wiring as a network. These “homeplugs” should do 500Mb/s, but you will never reach these speeds. In practice 10% is what you really get. Next to that, homeplugs send radio signals across your power lines turning the electrical wiring at your home into one big antenna. There are numerous reports of PLC networks that create so much interference that the entire HF radio spectrum is blacked out in a wide area. Imagine that aviation, military, emergency and rescue services, broadcast stations, radio amateurs and CB operators use this frequency range! This entry was posted in Blog by Jean-Paul Suijs - PA9X. Bookmark the permalink.